Ian Nicholls, AROnline‘s historian-in-residence, tells the Rover-Triumph story, and their part in the downfall of the British motor industry. Here, in the thirteenth part, he recounts how the profitable part of the loss-making British Leyland Motor Corporation had a number of exciting projects which were about to bear fruit and also explains the reasons behind the death of the controversial Rover P8 programme. On 6 January 1971, it was revealed that strikes had cost British Leyland, Britain’s biggest exporter, £30 to £40 million in lost profits in the previous 1969/70 financial year, and sent the group’s profit tumbling from £40.4 million to £3.93 million. Most of the labour disputes occurred on the Austin-Morris and manufacturing side of the business, and the £3.93 million profit was caused by a £15.95 million loss at its volume car division. This offset a £19.88 million profit from the Specialist Car (Jaguar Rover Triumph), Truck and Bus and Special Products Divisions and from British Leyland International. On 11 February, the BLMC Board met at Solihull to view scale models of the proposed replacements for the Rover P6 and Triumph 2000/2.5 PI executive cars (above). David Bache of Rover had produced six P10 scale clay models, five hatchbacks and a notchback, for consideration by the Board. However, the Rover P10 was not the only contender for the replacement. Triumph, although no longer in the running to engineer the vehicle, was still a contender to style the corporate executive car and brought along a model of its Puma proposal. Both projects were brought together for assessment, but the Board opted for Rover P10. Triumph’s Puma was thought to be too conventional in style. The chosen P10 alternative was selected at the viewing. At this stage, the P10 was now rebranded as the RT1. The same month, a new bored-out 1854cc slant-four Triumph engine was introduced into the Saab 99 range. By now Rover P8 prototypes were running with a possible launch in later in 1972. It was estimated that some £3 million had already been spent developing the car with Pressed Steel Fisher now working on the body tooling. All this optimism came crashing down in March 1971 when the Birmingham Post got wind that BLMC had cancelled the P8. British Leyland officially responded on 9 March. They told the media that the P5B 3.5-litre models would continue to be built for a “considerable time”. Employment at the Rover, Solihull, assembly plant would not be affected. Why was the P8 cancelled at such a late stage? Conspiracy theories have abounded over the years centering on Sir William Lyons and Jaguar. The oft-repeated story is that Sir William Lyons, who was the Deputy Chairman of British Leyland, saw the P8 as a Jaguar rival and demanded that the project was axed. Another theory is that the P8 rather embarrassingly failed at least two crash tests at MIRA (above), which is certainly plausible. Another factor may have been British Leyland’s dire financial state at the time caused by the wave of strikes paralysing British industry. The company was desperately trying to make economies simply to stay in business so perhaps the resources, both technical and financial, were simply not available for a final push to make the Rover P8 production ready, particularly if the design needed modifying after it failed the crash tests. One unnamed Rover executive said he thought the decision to axe the P8 meant a general long-term policy of slotting Rover in between Triumph and Jaguar. It is said that the decision to axe the P8 cost British Leyland a further £2 million in cancellation costs. In April 1971 the RT1 project was again renamed, this time it was the SD1. The projected car was now a five-door fastback design with a live rear axle. 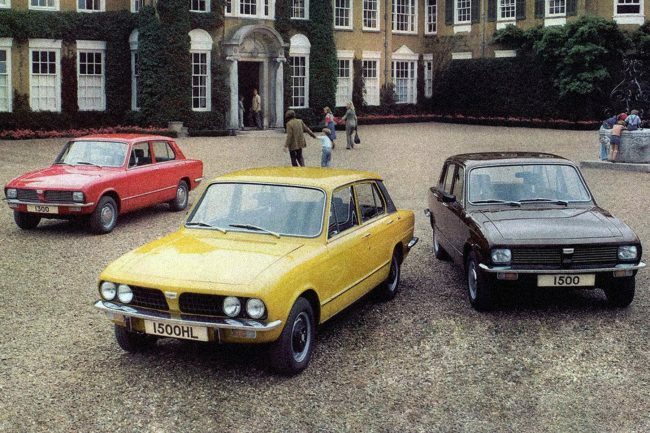 The unnamed executive was right, Rover was now slotted below Jaguar in the British Leyland hierarchy. The SD1 was to be designed to a price. On 23 April, British Leyland held a sports car policy meeting at Jaguar Cars’ Browns Lane plant. Among those attending were Lord Stokes, Bruce McWilliams and Spen King. The cars viewed was an early Triumph Bullet, the Jaguar XJ27 and the Austin-Morris ADO70, a Mini-based sports car. The next month, Michelotti completed the first running Bullet prototype (above). Triumph envisaged offering the Bullet with the 1500 SC, a 2.0-litre slant four and the 2.5-litre straight-six engines. The Lynx would be fitted with the 2.5-litre straight-six and the 3.0-litre Triumph V8, both available in two states of tune. As well as using the V8 in same state of tune as already seen in the Stag, Triumph hoped to offer a four-valve per cylinder version producing 233bhp. Presumably this 32-valve engine would use the same cylinder heads that appeared on the Dolomite Sprint in 1973? There was a styling presentation of the latest Rover SD1 proposals to Lord Stokes on 20 May. However, the design viewed in February, known to posterity as the ‘A body’ (above), had not scaled up well and it seems Michelotti was then asked to contribute a completely different design. 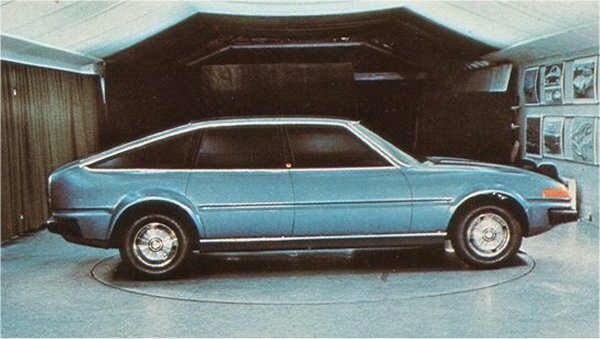 During May 1971, the first SD1 features list was prepared. Rover abandoned work on the 16-valve twin-cam 2204cc P6-derived engine in favour of a development of the Triumph six-cylinder engine, work on which had begun the previous year. These became the PE146 and PE166 engines of 1977. Rover decided to utilise the 2204cc block it had meanwhile developed to create a simpler single-cam engine for the P6. Triumph’s attempt to muscle in on the SD1 project was paying off, as not only had they got the job of developing the engines that would be in most of the models, it was also developing the SD1’s five-speed manual transmission, later known as the LT77. The man in charge of developing the LT77 was David Eley. What needs to be asked is why a cash-strapped British Leyland needed to develop yet more engines when there was already a plethora available to the company? Triumph seemed to be abandoning the masterplan conceived by Lewis Dawtrey back in 1963. The Triumph slant-four and its V8 derivative should have, in theory, been perfect for the lower-priced SD1 models. Engine confusion: why no rationalisation? After all, the Triumph V8 had originally been 2.5 litres. The resources devoted to developing the PE146 and PE166 could have been better used turning what Triumph already had into more reliable power plants. And if the Triumph V8 maybe lacked low speed torque, what about the now discarded 2.5-litre Daimler V8, an engine that actually worked? Also there was the 2227 cc Austin Morris E6 in the pipeline. British Leyland was to spend money on engines which in theory might have been technically better than what was in the parts bin, for a car which was meant to be technically inferior to cut manufacturing costs. The next day the last Triumph Herald – a 13/60 convertible, came off the No. 1 assembly line at the Canley works. Bill Sanders, Director and General Manager drove the white convertible off the line to cheers from workers. ‘The Herald has been a good friend to us through some difficult times,’ said Mr Sanders, who was responsible for opening the Canley assembly where also the 532,412 various Herald cars had been made since the model was introduced in April 1959. By now the Herald seemed a relic of the past. This was also the year the Morris Minor departed the scene. On 1 July, Land Rover celebrated the production of the 750,000th Land Rover with Chairman Sir George Farmer in attendance. 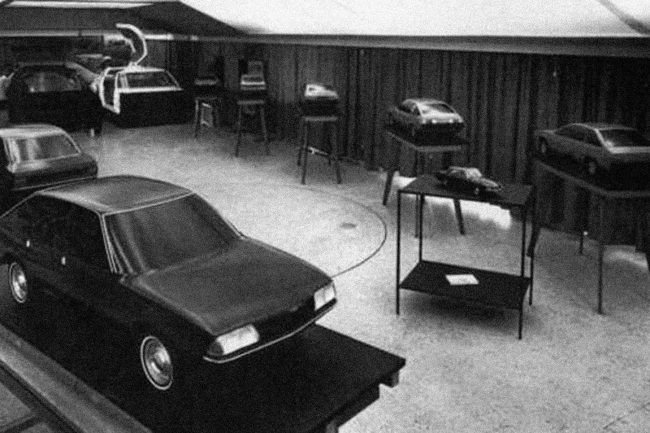 A week later senior British Leyland management viewed a 1:3 scale model of the Michelotti proposal for the Rover SD1 project. The whole SD1 project now seemed to be taking on farcical proportions, with development authorised of engines that were not actually needed and now a dithering by management over the look of the car. 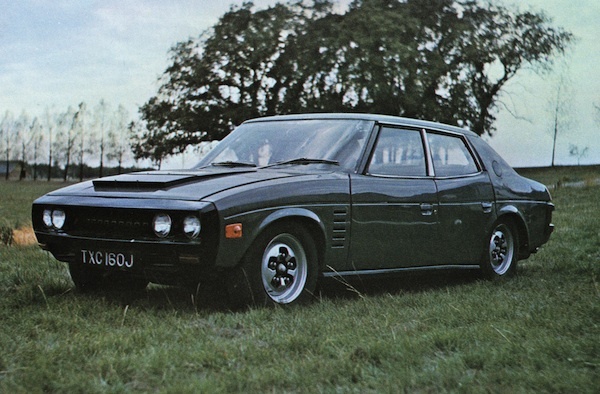 Having rejected Triumph’s Puma and selected a David Bache design that did not work out, British Leyland was now seeing what Michelotti had to offer. Neither of these three designs became the production SD1. The same month at Longbridge BLMC management convened to view designs for the corporate sports car. On offer was the Triumph Bullet and a full-sized MG-badged clay design from Harris Mann of Austin-Morris. Despite that £2 million had already been expended on Bullet, Lord Stokes preferred the wedge-shaped Harris Mann design (above). As compensation Triumph was given the job of engineering the corporate sports car. In a nutshell, Triumph now had to adapt the Harris Mann design to their mechanicals to create the corporate sportscar. With Austin-Morris busy with the ADO67 Allegro and ADO71 18-22 and Rover engineering the SD1, it was a logical decision. As Triumph was tasked with developing the corporate sports car, it retained the codename ‘Bullet’. Smith continued: ‘It is always a great problem to keep a balance between what the engineers want, what the stylist wants and to resist pressure from the commercial people “to do things. You can so easily have the car wrongly orientated, but Peter in the most friendly way would change the overall balance between the various groups and would get it right. Who immediately filled the void left by Peter Wilks departure isn’t clear. Presumably it was his deputy Gordon Bashford. 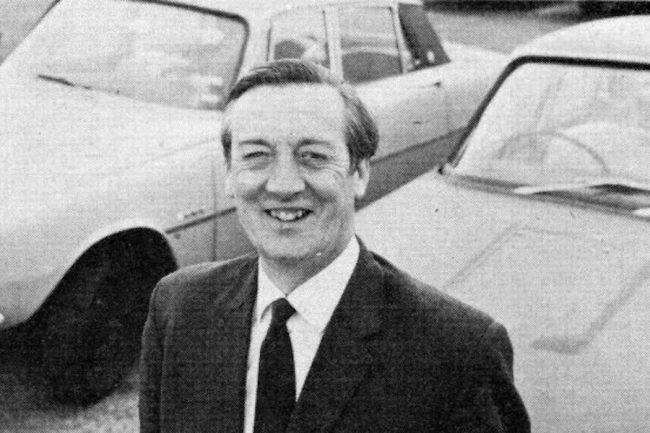 Another Rover personality who departed the scene in 1971 was Spencer Wilks, the company President. He died at the age of 79 years. While the members of BLMC’s Specialist Car Division had to be coerced into sharing components, one enterprising man fitted a Rover engine to a BMC car. 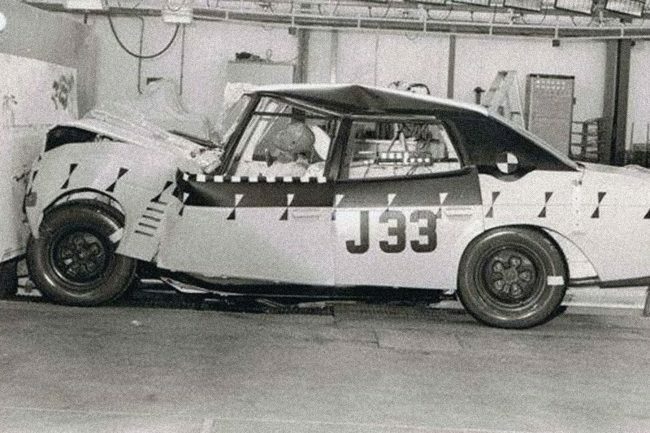 This was Ken Costello, a Mini racing driver operating out of Sidcup in Kent. He set up a business fitting Rover V8 engines to MGB sports cars (above), creating the kind of vehicle the factory’s own MGC should have been. On 4 August, British Leyland instructed MG at Abingdon to build an MGB GT V8 prototype, after the evaluation of a Ken Costello-converted car. Abingdon had fitted a 2.5-litre Daimler V8 to an MGB back in 1967, but it was not a running prototype. The next day the controversial Industrial Relations Act 1971 became law. In late August 1971, Bill Davis, the Triumph Managing Director wrote in the division’s newspaper about two unnamed Japanese cars he had examined. While the Japanese threat was mounting, Bill Davis said, an acceptable percentage in terms of Triumph’s production programme had not been achieved on any day or for any week, during the 1970/71 financial year. The Dolomite was the latest variation on the 1965 vintage Triumph 1300. It used the longer bodyshell of the front-wheel-drive Triumph 1500, but with the majority of the running gear carried over from the rear-wheel drive Triumph Toledo. The engine was the 1854cc derivative of the slant-four unit, its first use in a Triumph car, although it was already being used by Saab. The company’s advertising campaign for the new car was postponed indefinitely and urgent action had to be taken to withdraw details of the car from four million copies of the AA’s magazine, Drive, which was already at the printers. Triumph had been hit by three disputes, in the previous few days, internal drivers, members of the Transport and General Workers Union, refused to move cars from the assembly lines because of a manning dispute. Skilled tool room workers were operating an overtime ban and a policy of non-cooperation as part of a campaign by the engineers’ union to prevent employers ending the wartime Coventry toolroom agreement. Finally, there was a dispute over piecework rates on the Dolomite. Lord Stokes was adamant that no new models would be announced until there were enough stocks available for delivery. The piece-work system also discouraged the introduction of necessary improvements. The candidate for this quote has to be Sir Alec Issigonis, who was maligned for failing to introduce improvements to his designs. 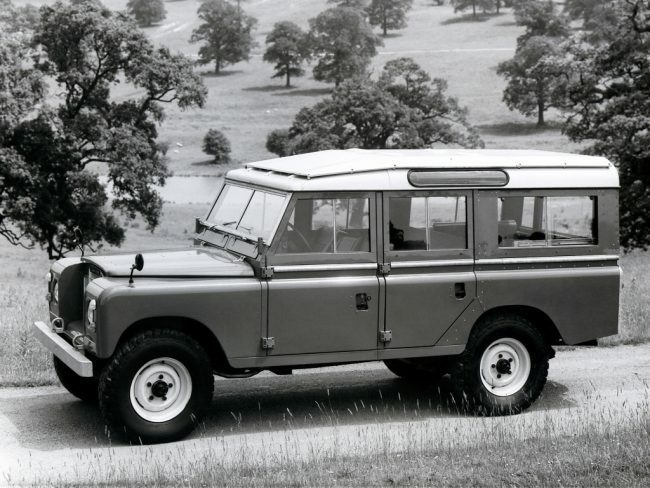 That September the Series III Land Rover (above) was announced. The major changes were to the styling and the model now featured an all-synchro gearbox, now known as the LT76. 1971 was the peak year of Land Rover production. From this point on Land Rover sales came under sustained assault from Japanese brands such as Toyota with the Land Cruiser series, which had a reputation for superior reliability and higher build quality. On 4 October, British Leyland decided to build Project Bullet bodies at Speke No.1 on Merseyside, but was vague about whether final assembly would take place there at the No.2 plant or at Canley and/or Abingdon. At this stage it was still going to be both a Triumph and MG.
That October Rover announced the 3500S, a P6B with a manual transmission. This had been achieved by beefing up the existing P6 four-speeder. With a 0 to 60 mph time of 9.1 seconds and a top speed of 125 mph, the 3500S unleashed the true potential of the V8 engine. Rover SD1 styling: finally a breakthrough! Over the weekend of 19-22 November David Bache got to grips with the styling of the Rover SD1. Taking his influences from the Maserati Indy and Ferrari Daytona, he added curves to his original angular design to create a full-size clay model which was much closer to the definitive design. It would be further refined in December as the ‘B proposal‘. So ended 1971 and at last British Leyland was beginning to co-ordinate the activities of its Specialist Car Division, bringing the disparate threads together with coherent development programmes for the future. Triumph would now develop the corporate sports car while Rover would develop the corporate executive car. In addition to this Triumph would also develop a new five-speed manual transmission for use on the division’s cars. By replacing multiple cars competing in the same market sector with a single corporate model, Lord Stokes proposed to rationalise British Leyland in a gradual way, a process that would take until at least 1977 to pan out. In this way, he could hope to avoid confrontation with the British Leyland (Motor Corporation Combined) Trade Union Committee over the thorny issue of redundancies. A Coventry Climax V8 (CFF or CFA) was also tested in an MGB along with a Triumph 2000 Estate owned by Leonard Pelham Lee, which Walter Hassan mentioned in 2.5-litre CFA form was capable of more than 200 hp at 7000rpm and weighing 300 lb in flexible sportscar tune. With Bullet envisioned being powered by a 1500 SC engine, it makes one think back to whether a similar plan was envisaged for the Triumph Fury had it reached production as a replacement for the Spitfire. Apart from believing the merger should have never happened and that both companies should have acquired different carmakers to make things more balanced, am not sure whether it was possible to adequately rationalize the engines at BL without significantly altering a few engines early on in their development (as well as dependent on BL replacing the in-sump gearbox with an end-on layout for FWD cars). A properly-developed significantly shorter E-Series for example could have become BL’s equivalent of the Volkswagen EA827 featuring a 2-litre inline-4 variant that is much better then the 2-litre O/M/T-Series engine, along with spawning 3-cylinder, 5/6-cylinder and V8/V10+ (plus diesel) derivatives (see Porsche 928 for proposed V10 derived from a pair of EA827 inline-5s). A properly-developed Issigonis 9X engine (given it is presumed in some respects to be in essence a downscaled E-Series) could have been BL’s equivalent of the Volkswagen EA111, capable of properly replacing the 1.3 A-Series (with displacements up to 1.6-litre+) and potentially spawning if necessary an inline-6 along with 3-cylinder (plus diesel) variants. Blog: Why do everyone else’s number plates look cooler than ours?